Last year, we asked homeless youth service providers about the lesbian, gay, bisexual, transgender, and questioning (LGBTQ) youth they work with, and the information they shared is important to consider as we work to end youth homelessness. We also asked them to share their experiences working with lesbian, gay, bisexual, and questioning youth separately from their experiences working with transgender youth, so we could better understand the needs of transgender youth. While all youth experiencing homelessness face similar challenges, agency staff estimated that some of these challenges are exacerbated for LGBTQ youth. For example, service providers reported that LGBTQ youth are homeless for longer periods of time than non-LGBTQ youth and that LGBTQ youth accessing their services were in worse mental and physical health than non-LGBTQ youth. In particular, providers were more likely to report that transgender youth experienced these disparities. We also learned that LGBTQ youth continue to be overrepresented in the population of youth experiencing homelessness, and that LGBTQ youth experience homelessness for a variety of reasons, including the intersection of homophobia & transphobia, poverty, and failed systems. According to service providers, the majority of LGBTQ youth they work with are homeless due to identity based family rejection. Additional reasons include family issues, aging out of the foster care system, family poverty, and abuse in the home. Housing was the number one need for LGBTQ youth experiencing homelessness, as identified by providers. Transition-related support was also identified as a critical need for transgender youth. Transgender youth are estimated to have experienced bullying, family rejection, and physical and sexual abuse at higher rates than LGBQ youth. 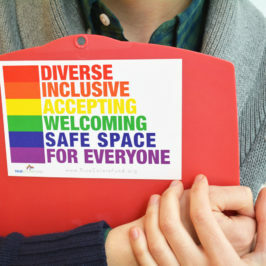 Survey respondents cited staff qualities and characteristics, such as LGBTQ-inclusion and staff competencies, and program qualities, such as targeted programming for LGBTQ youth, as reasons for success in serving LGBTQ youth who are homeless. Many respondents also point to lack of training in serving LGBTQ needs as a barrier. The study, titled “Serving Our Youth 2015: The Needs and Experiences of LGBTQ Youth Experiencing Homelessness,” highlights the need to further understand the differences in experiences between LGBTQ youth and non-LGBTQ youth experiencing homelessness, as well as between cisgender LGBQ youth and transgender youth. The data suggest staff training, targeted programming, and an environment of inclusion have helped providers better serve LGBTQ youth experiencing homelessness, yet, these strategies also appear to need further examination and evaluation. As True Colors United’s Chief Creative Officer, Joe works at the intersection of communications, technology, and design. He leads the organization's communications and marketing strategies and heads up digital programs.